Clinical research shows that tracking symptoms and other indicators is a low-cost, effective health intervention.10 This is the first national survey measuring the extent of tracking among the people most likely to benefit—those living with chronic health conditions. Seven in ten U.S. adults living with one chronic condition and fully 80% of people living with two or more conditions track a health indicator, for themselves or for someone else. 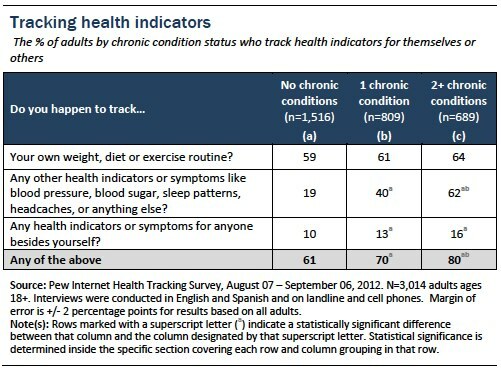 By comparison, 61% of adults living with no conditions track some aspect of health. When controlling for age, income, education, ethnicity, and overall health status, living with chronic conditions increases the probability that someone will track a health indicator. Education and age also play a role. Being college-educated increases someone’s likelihood to track their weight, diet, or exercise routine. College-educated adults, however, are less likely to track other health indicators like blood pressure, blood sugar, sleep patterns, or headaches, possibly because they are less likely to be living with a chronic disease or other health condition. Being younger (between the ages of 18 and 39) is also independently associated with a lower likelihood to track other health indicators. 41% of health trackers who report having one or more chronic conditions use pencil and paper. 14% of this group uses a medical device such as a glucometer. 4% of this group uses an app or other tool on their mobile device or phone. 4% of this group uses a computer program, like a spreadsheet. 1% of this group uses a website. However, informal means are also popular: 43% of health trackers living with one or more chronic conditions say they just keep track in their heads. Indeed, 50% of trackers living with one or more conditions say they track on a regular basis, compared with 43% of trackers who report no conditions (a statistically significant difference). The gap widens among those with multiple conditions and when looking at the most frequent interval we asked about: 28% of trackers living with two or more conditions say they do so daily, compared with 11% of those with no conditions. Forty-five percent of trackers living with one or more conditions say they keep track of health indicators only when something comes up or changes. 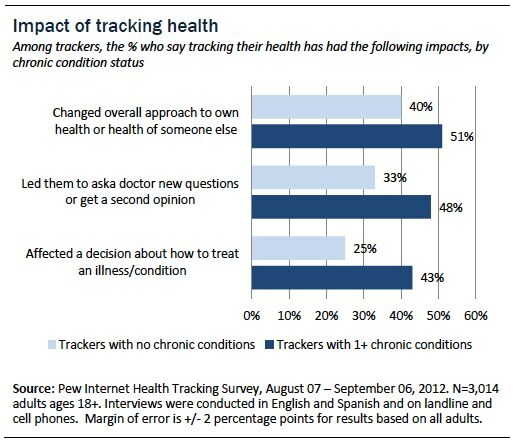 By comparison, 54% of trackers who report no conditions say they keep track episodically. 39% of trackers living with one or more condition share their notes, compared with 30% of those who report no conditions. Of that group, two-thirds living with chronic conditions share tracking notes with a health or medical professional: 64% do so, compared with 37% of those who report no conditions. Seventy-two percent of trackers living with one or more conditions say tracking has had an impact on their health or the health of someone they care for, compared with 55% of trackers who report no conditions.